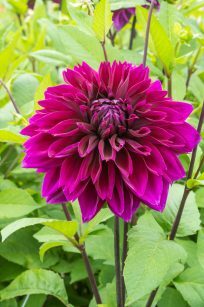 Because Dahlias can range in height from a mere 7” to approximately 48”, it is important to select their location in the garden carefully. 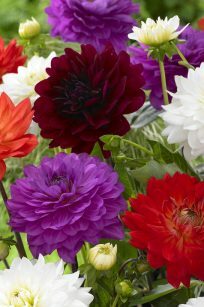 Low growing varieties look best close to the edge of a border with taller varieties progressing to the back. 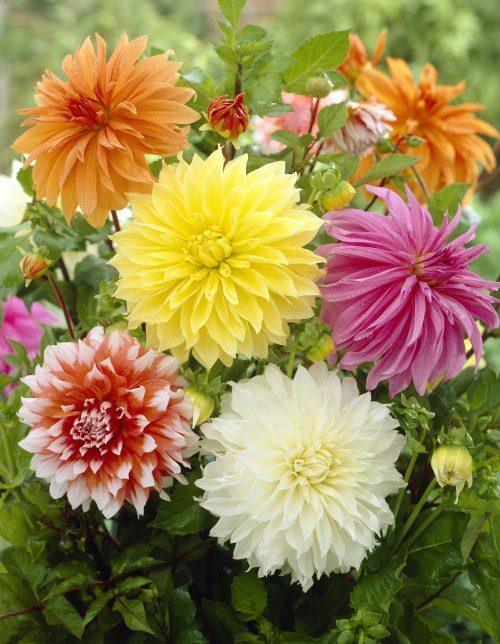 All Dahlias should be planted after all danger of frost has passed. Choose a sunny location that drains well. Dig a hole about 12” deep and allow 12” to 36” of space between tubers depending on variety. Amend the soil with peat moss or compost and place half of it back into the hole. Lay the tubers out flat in the soil, replace the remaining amended soil. Do not water until shoots appear. Water deeply 2-3 times per week. For larger blooms, buds should be pinched back. On varieties where buds appear in clusters of 3, pinch off 2 of the buds leaving only the center bud to flower. Pinching buds back will help to retain the size and shape of the plant. 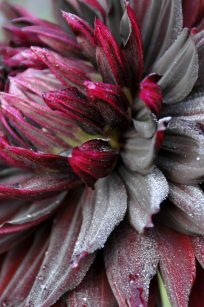 Dahlias are winter hardy in zones 8-10. In all other zones, dig up the tubers carefully after the first fall frost has killed the foliage. 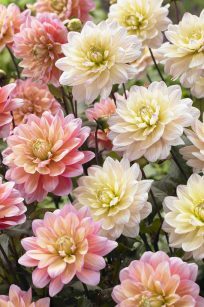 Let the tubers dry thoroughly and pack them in sawdust, dry sand, or peat moss. Store the tubers in a cool (40⁰ – 45⁰), dry place. In the spring, separate the tubers from the stalks leaving about 1” of stalk attached. 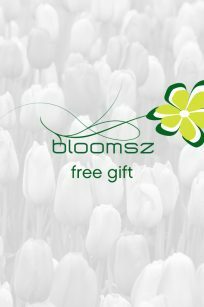 Each tuber must have a bud or an eye to bloom. Replant and enjoy!